Greece Soccer Team - EURO 2004 Champions - Angelos Charisteas - by La Cancha-News On World Cup 2006 - "World's Leading Soccer Magazine!" A tall striker who uses his considerable stride to outpace defenders, Angelos Charisteas wrote his name in football history with the winning goal in the 2004 UEFA European Championship final for Greece. 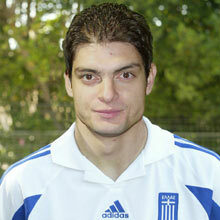 Charisteas played in the 2002 UEFA European Under-21 Championship having already turned out for Greece's senior team. Indeed, the Serres-born forward had made a memorable start to international football, scoring twice in a 3-3 draw against Russia and once in his second outing against Germany, adding to the tally against England at Old Trafford in 2001. Charisteas continued his scoring exploits as Greece quaified for UEFA EURO 2004, and then in Portugal scored the vital equaliser against Spain, the winner in the quarter-final against France - and the only goal in the final versus the hosts as his nation were crowned champions. It was during his first stint at FC Aris Thessaloniki following a move from non-league Strimonikos Serron that Charisteas proved he was one for the future, scoring twice in nine matches as the northern club won the Greek second division in May 1998. The striker subsequently made 12 appearances in the Alpha Ethniki - six as a substitute - before spending time on loan at Athinaikos FC in the 1998/99 season. 1999: Returned to Aris and made his European debut in a UEFA Cup defeat by RC Celta de Vigo at the age of 19. Charisteas was continually developing and in 2000/01 scored seven goals, his best return in Aris colours. 2002: Having been watched by scouts from a number of Europe's leading sides, Charisteas opted join his national coach Otto Rehhagel's former club SV Werder Bremen on a four-year contract in June 2002. The 3m fee also made the Greek the most expensive signing in Bremen history and he scored nine goals as the Weserstadion side finished sixth. 2003/04: Bremen enjoyed a dream of a campaign, winning the Bundesliga - Charisteas scoring four goals in 24 games - and the German Cup.